There are a few reasons why our customers choose us and keep coming back to us, time and time again. We are a family owned and locally operated company all throughout California. Our California water heaters are superior to the other choices out there. While we don’t like to brag, it has to be said that we are specialists in what we do. We guarantee that we will save you a significant amount of time and money, not to mention the hassles you will definitely encounter with other companies. We offer some of the best water heaters in Los Angeles. When you decide to have a water heater installed or fixed, you don’t want to use just any old plumber. Our technicians are extremely knowledgeable about everything related to water heaters and tankless water heaters. Our technicians carry all the necessary parts and equipment in their trucks. You can just think of them as a water heater plumber because they have the knowledge to repair any make or brand of water heater. That is something you won’t find in any old plumber. When it comes to water heaters, you need an expert to handle it! 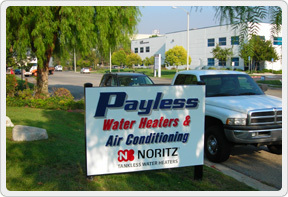 We Can Also Install a Noritz Tankless Water Heater the same day as well – We are the specialists. Whether you’re in an emergency situation or not, we will deliver same day service once you contact us. Unlike many of our competitors, we don’t charge extra for work that we do on nights or on the weekend. Nights and weekends are simply part of our job. We know that you can’t control when you need a hot water heater replacement. These things are usually very unpredictable. For that reason, we never charge any additional fees for nights or weekends. We are here to help you out of your water heater crises. We will never leave you stranded- there is always a live person you can talk too, 24 hours a day. Every time you speak to one of our customer service representatives or dispatchers on the phone, we will schedule a 2 hour time window for the time that the technician will arrive at your home. While we have you on the phone, we may ask you some questions in order to best suit your needs. Some of the important questions that we ask are whether you have a gas or electric water heater and the location of the unit. Clearly getting an idea of the size is equally important. Asking questions ahead of time helps us become familiar with your particular needs and situation which will speed up the process. That way, when we pull into your driveway, we will have the perfect water heater for you and your family. Having this information on hand prior to the call will speed things up. Please be sure to let our customer service representatives know about any other special circumstances so we can be fully prepared to handle any Hot Water Heater Problems when we arrive at your home. If for some reason, our technician is running late for the scheduled time window, a customer service representative or the technician will call you to let you know.